subject to the following conditions. 4) The selection to the said post is subject to the outcome of W.P’s in Hon’ble High Court and other courts if any. If it comes to the notice of the Commission at a later date that any candidate furnished false information or the selection is not in order due to any act of omission or commission of any candidate , then his/her provisional selection is liable to be cancelled at any stage and he/she will forfeit all consequential benefits including that of selection, besides that the Commission reserves the right to take any action as it deems fit in the circumstances of the case, in terms of the various provisions as notified in the Notification No. 15/2017. It is hereby informed that on the basis of the Main Examination for the Post of Physical Director (Schools) in various REIS, a total 06 candidates are provisionally picked up in the ratio of 1:2 against the total 06 vacancies for Certificate Verification to be held on 19/01/2018 at TSPSC office at 10.00.AM.. Please visit Commission’s website (www.tspsc.gov.in) for results, proforma of Verification Material and further details. On the basis of Main Examination held on 07/09/2017 for the Post of Physical Director (Schools) in various Residential Educational Institutions Societies, 06 candidates with the following Hall Ticket Numbers are provisionally picked up in the ratio of 1:2 for Certificate Verification against total No. of 06 vacancies. The Certificate Verification is scheduled to be held on 19/01/2018 at TSPSC office from 10.00 A.M onwards. The candidates who are called for Verification of Certificates have to produce the following certificates in Original along with a set of Photostat copies duly attested by Gazzetted Officer at the time of Verification of Certificates, failing which, they will NOT be admitted in subsequent process of selection No request will be entertained for subsequent submission of any of the required certificates. In terms of the Notification, the candidate should possess the requisite qualifications as on the date of the Notification. The Commission reserves right to disqualify any candidate, if he/she is not found eligible for any reason at any stage. Admission to Verification of Certificates does not confer ipso facto any right for Final selection. 5) Provisional /Convocation Certificate and Marks Memo . 12) 2 sets of Attestation forms duly signed by Gazzetted Officer. PHYSICAL DIRECTOR (SCHOOL), ART TEACHER, CRAFT TEACHER, MUSIC TEACHER VIDE NOTIFICATION NOs. 15/2017, 17/2017, 18/2017 & 19/2017. TSPSC has conducted Main Examination for Physical Director (School) on 07-09-2017 and Written Exam for the posts of Art teacher, Craft teacher and Music Teacher on 31-08-2017 and 01-09-2017. The final keys of these notifications will be available on commissions website www.tspsc.gov.in from 17-10-2017. No further objections will be entertained on final keys. A Graduate in Physical Education with 40 % marks or Graduate in Physical Education i.e., B.P.Ed course (or its equivalent) of three years duration course. Minimum 18 years & Maximum 44* years. The age is reckoned as on 01/07/2017 (Rule- 12(1)(a)(v) of State and Subordinate Service Rules). *As per G.O. Ms. No. 329 GA(Ser.A) Dept., Dt. 27/07/2015 read with G.O. Ms. No. 264 GA(Ser.A) Dept.,Dated: 26-07-2016, the upper age limit is raised up to 10 years. N.B. : 1) No person shall be eligible if he/she is less than 18 years of age. 2) No person shall be eligible if he/she crossed 58 years of age (Superannuation age). (a) FEE: (Remittance of Fee) Each applicant must pay Rs. 200/- (RUPEES TWO HUNDRED ONLY) towards Online Application Processing Fee. This apart, the applicants have to pay RS. 120/- (RUPEES ONE HUNDRED AND TWENTY ONLY) towards Examination Fee. However, the following category of candidates belonging to Telangana State only are exempted from payment of Examination fee. b) Mode of Payment of Fee:The Fee mentioned at Para-I(6)(a) is to be paid online through SBI ePay duly following online instructions once the application form details are submitted by filling TSPSC ID, date of birth and other particulars. The fee once remitted, shall not be refunded or adjusted under any circumstances. Failure to pay the examination fee, application fee, wherever applicable will entail total rejection of application. The list of Banks providing service for the purpose of online remittance of fee is given in ANNEXURE – II. Eligible candidates may apply through online mode only from 10-03-2017 to 09-03-2017. Hallticket Download for Notification no. 15/2017 Physical Director (School) in Residential Educational Institutions Societies. Hall Tickets can be downloaded 07 days before commencement of Examination from the TSPSC Web portal. 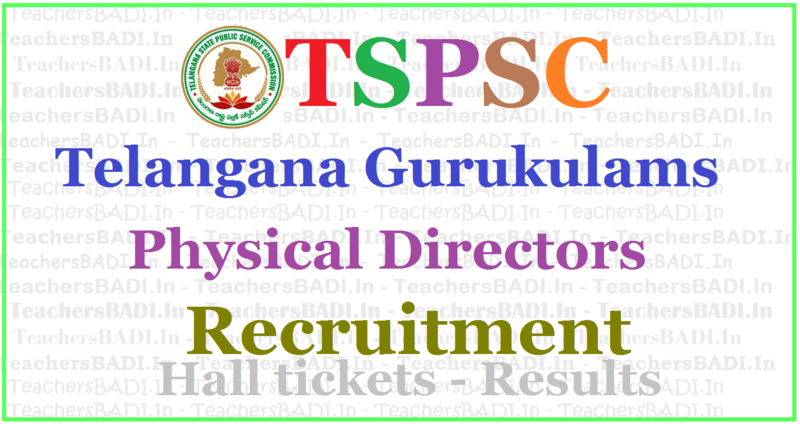 TSPSC Gurukulam PDs Recruitment Hall tickets are available on tspsc web portal and TSPSC Gurukulam PDs Recruitment Main Exam date is 07-09-2017. (TSPSC PD Preliminary Exam Results): TELANGANA STATE PUBLIC SERVICE COMMISSION:: HYDERABAD:: Provisional List of eligible candidates for Main Examination for the post of PHYSICAL DIRECTORS in various Residential Educational Institutions Societies vide Notfn. No. 15/2017 (General Recruitment). It is here by notified that on the basis of combined & common Preliminary Examination held on 31-05-2017 for the Posts of PGT, TGT & PD in various Residential Educational Institutions Societies, the candidates with the following Register Numbers are provisionally picked up in the ratio of 1:15 for Main Examination for the post of PHYSICAL DIRECTOR. The Main Examination will beheld on 18/07/2017. Against total No.of 06 vacancies, there is a short fall in selection of candidates in 1:15 ratio with respect to certain categories. The candidates are directed to visit Commission’s website www.tspsc.gov.in for further details. PDs Mains Hall tickets: Hall tickets for Written Examination for the Post of Physical Director (Schools) in Residential Educational Institution Societies Main Examination (General Recruitment) Notification No. 15/2017 .